This picture was taken in Oakland Cemetery in Atlanta, Georgia. Who would have thought a walk through the cemetery could be beautiful. 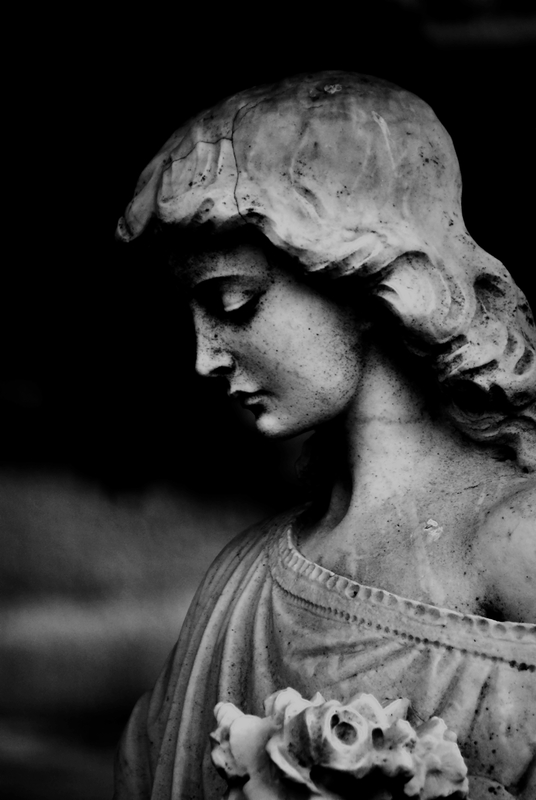 This cemetery is home to many elaborate statues of angels , cherubs, saints, and other ornate headstones. I felt in the beginning kind of awkward photographing these memorials , wandering through gravesites wondering who these people were , what they accomplished in their lifetime. Reading headstone after headstone… But after a few shots I realized just how beautiful some of these statues and memorials really were. Some had cracks much like this one, discolorations, missing angel wings, missing noses, legs , arms, broken flowers or musical instruments in their hands,but all beautiful in their own way. As I walked slowly photographing angel after angel I couldn’t help but wonder what my gravesite would look like. Would it be plain? Would it be adorned with angels, pretty words or just a name and year of birth and year of death? Who would be the one to choose what my headstone would read. Would I approve of it if i were alive? Would it be a family member to choose it or some stranger. Then I decided would it even really matter? Oh well!! Some of these statues were larger than life and I couldn’t help but wonder what the cost of something like this would be. I am sure they were expensive, some were made of marble, some granite, still some I wasn’t quite sure what they were carved out of. Were these the gravesites of the rich, or were these massive statues the norm from the era in which they were born? I did see the final resting place of Margaret Mitchell, author of the famous book Gone With the Wind. The cemetery is quite large and after taking so many photos I decided that I would have to revisit this place again someday just to be sure I didn’t miss any.